Modern Italian cuisine in a sleek, cosmopolitan setting with an indoor bar and a summer patio perfect for people-watching. : Exposing a large room and bar with brick walls, exposed steel beams, dark espresso-bean wood floors, and chic furniture in light green suede and white leather, NoRTH is one of Cherry Creek's sleekest gathering places. Leggy blondes lunch with friends out on the tiny patio and air-kiss passing acquaintances; well-dressed men sit inside, conducting business; and high-heeled shoppers stop at the bar for frizzantes, flutes of sparkling Prosecco flavored with fresh fruit purées, before heading home. We always start with the zucca (thin, addictive fried zucchini chips), grilled artichokes with a drizzle of truffle oil or crisp calamari with baby arugula and grilled lemons. 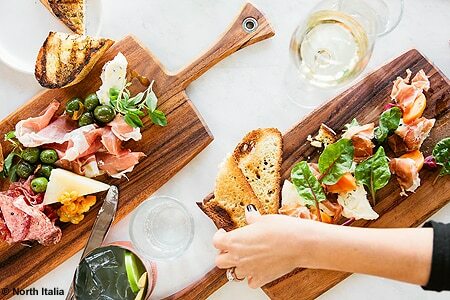 Flat-crust pizzas from the wood-fired oven come with dozens of unusual toppings like duck confit, pear and farmers' cheese; our favorite features sweet figs and prosciutto. Pastas include strozzapreti (priest-stranglers) with mushrooms, wilted spinach and Parmesan; and classic pasta Bolognese topped with paper-thin curls of Reggiano. For a main dish, ask about the fresh fish of the day. We also recommend the osso buco, served with a super-creamy polenta, or the simply grilled flank steak with fingerling potatoes. For dessert, try the warm and gooey Nutella chocolate cake. The wine list is heavily Italian, with more than 30 selections by the glass.